to benefit the Connecticut Humane Society Pet Food Pantry. iGRAFIX will be collecting all kinds of unopened and unexpired pet food for the Connecticut Humane Society’s Pet Food Pantry at two drop-off locations in Collinsville, CT and Manchester, CT. For locations please scroll down. “Holding this pet food drive will help people keep their pets. Being able to keep a beloved four-legged friend avoids a stressful situation for owners and their furry friends. If a pet has to leave its home it could mean an uncertain future for the animal, not all pets end up in a shelter with a no-kill policy. Millions of unwanted cats and dogs are euthanized in the United States every year. That makes it even more important to have pet food pantries available and well stocked,” DiBenedetto states. 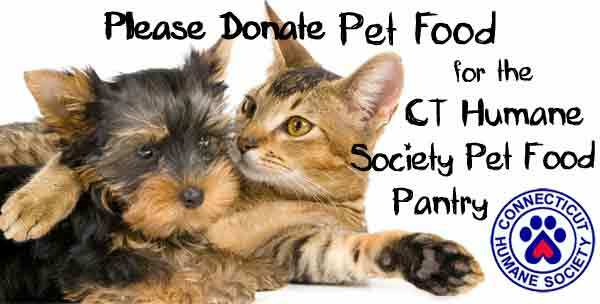 The Connecticut Humane Society established the Pet Food Pantry in November 2010. The pantry currently supplies food for hundreds of dogs and cats each month. Please help make life a little easier for our friends in need. Your generosity will help families keep their pets at home and is appreciated more than you will ever know! 30 lbs of food will feed one dog or three cats for one month. Our goal is to collect 300 lbs of food, helping 10 dogs or 30 cats. I am sure the families and pets appreciate this. Meow meow, woof woof = thank you! I adopted my cat and puppy from a shelter, I would be devasted if I had to give them up. They’re part of my family. The pet food pantry is great and I thank you for supporting them. We at The Spa Expectations Corp would love to assist. I will either have my CT Director drop off or we will write a check. This is wonderful and I commend you. It’s sad but true – pets are brought to the pound in hopes they will find a new home. Unfortunately more often than not they’re being put to sleep. The pet food pantry is an excellent cause to support.